From Texas ranch country to the Kaimai Ranges, overlooking Katikati and the Bay of Plenty, is a journey the Craft family has made, and one they are each delighted with. Logan and Barbara Craft, with daughters Sarah-Catherine and Ann-Elise, first visited New Zealand in 2013. On a year travelling out of Texas, looking at different parts of the world and considering where to put down roots for an overseas adventure, they found New Zealand easy to fall in love with. “We knew we wanted to live abroad. We wanted our girls to gain a sense of the greater world, outside the United States,” says Barbara. we actually had to ‘give it a go’ and move,” says Logan. Having worked and spent time in South America, Europe, Africa and Mexico, among others, they preferred an English-speaking country, particularly for Sarah-Catherine and Ann-Elise. “We didn’t want to disadvantage them, and learning in English really helps from an educational standpoint. To us, for young children, the benefits of an education in a foreign language were not clear enough, although we certainly want more exposure for them in foreign languages as they grow older,” says Logan. “When we first came, everywhere we went we were surrounded by incredible beauty. Green grass, mountains, oceans, fresh water. And to have no poisonous snakes or other creatures, unlike in Texas, or elsewhere, was a big plus,” says Barbara. “On top of everything else, there are the people. Everyone made us feel welcome everywhere we went. We didn’t have one negative experience with any New Zealander. It is such an open culture, which values children so highly, and always made our girls feel welcome. That was a big deciding factor for us,” says Barbara. With so much positive reinforcement, the decision to opt for New Zealand was inevitable. Returning to Texas, they set about applying to migrate across the Pacific. In the meantime, Logan, whose business career has included commodity materials and metal manufacturing, private equity, and media ventures, as well as agriculture, returned on a business trip to Auckland, and managed to combine that visit with additional fact-finding to pinpoint their ideal New Zealand base. “Tauranga has a vibrant economy, is a small though growing port city, has real agriculture, light industry, and plenty of tourism opportunities. It is also a sportsmen’s paradise, with hunting, fishing and tramping, so I knew it was going to work for us,” he says. That was in mid-2015, around when their application to immigrate was approved. They moved about seven months later, arriving in January 2016, in time to enrol the girls for the new school year at Tauranga’s Bethlehem College, where the emphasis on faith was a good fit for the family, and helped them make new friends. “It takes a while to put down new roots. Our plan is for New Zealand to be our long-term home. Coming into the church community has helped that plan considerably. It has given us new friends with good advice, pot-luck suppers, afternoon tea, opportunities to help people in need, and is a pathway to integrate quickly into the community in both Tauranga and Katikati, which has helped confirm that this is our home,” says Barbara. Although they didn’t rush the property search, by May last year they were ready to look. Andrew Fowler of PGG Wrightson Real Estate, Tauranga, had a listing. “For Logan, Barbara and their girls, we had a stunning home on approximately 30 hectares bordering the Kaimai-Mamaku Forest Park and Conservation Area, which is a special place with massive rimu and other giant native trees dating back hundreds of years. 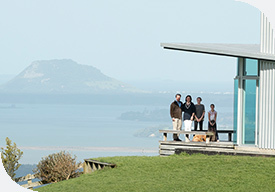 As well as the forest park, the house commands outstanding views across the Bay of Plenty and out to the Pacific Ocean. Meanwhile, the house itself, essentially new, had been built to the highest standard, fitting of the locality and view,” says Andrew. Yet again, opting for this house was a simple decision for the Craft family. Barbara says the girls have taken to it well. “They absolutely love this home and this property. It is everything they dreamed about. We can be at Mount Maunganui beach in 30 minutes, or at Waihi Beach, which is our favourite spot, in 20. They are settling in, and making friends. They love their rooms and their house. We are horse people, and in Texas we were members of the junior pony club, so we expect to assimilate with the Western Bay of Plenty Pony Club in due course,” she says. For Barbara, this has been more than just a shift of countries. “What also makes it different for us is we had children a bit late in life. I had a 20-year career as a human resources executive, and withdrew from that career to move to New Zealand. I have chosen to focus on family, supporting our girls, making sure we are acclimated and working with Logan on the farm, and the businesses he is developing,” she says. With a mob of rising one-year-old heifers fattening up in the paddocks, the Texan heritage is evident as they pursue one of the factors that motivated their choice of this country. “We are keen admirers of New Zealand agriculture, which obviously has an impressive track record. We’ve enjoyed learning the kiwi way and incorporating cattle-raising methods that are standard practice here, though new to us. Some of it is very different from how things are done in the States. From our vantage point, the New Zealand livestock business is really robust overall. It’s a good fit and a great opportunity in this country,” says Logan. Since moving in, they have also covenanted part of the stream that runs through the property. As Logan says, conservation is important. “I’m happy to do my part to help the environment and keep the water clean and pure. Back in Texas, we covenanted out a large amount of riparian land for conservation, and I’ve been active in managing and protecting that property and the river on it. There are plenty of ways to provide stock with water in New Zealand. We don’t need to have our cattle drinking directly from the stream on our property. However, we recognise that isn’t necessarily so easy everywhere else. “I applaud the approach of the regional council in not strong-arming farmers to protect their water with unreasonable policies. I think it is more sensible to encourage people with a carrot, and use a win-win programme whenever possible, rather than beating them over the head with a stick. Fortunately, the win-win scenario has been our experience with how the Bay of Plenty operates. They’ve been great,” he says.